neutralizes the highly-reactive and toxic carbonyl compounds formed from the breakdown of glucose and lipids. Since carbonyl stress' plays a significant role in the development of Alzheimer's disease, the ability of pyridoxamine to trap carbonyl groups may offer benefits in the treatment of this disease. It therefore appears that pyridoxamine can limit the damage to proteins created by glycoxidation and lipoxydation reactions and may be beneficial for diseases which involve hyperlipidaemia and/or oxidative stress. Pyridoxamine's many activities and properties make it a promising option for treating the complications of diabetes and age-related degenerative diseases involving oxidative reactions and carbonyl compounds. 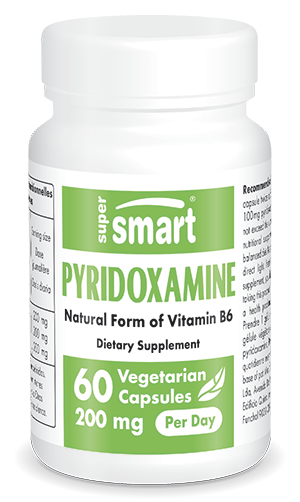 Each vegetarian capsule contains 100 mg of pyridoxamine hydrochloride. Take one vegetarian capsule twice a day or as advised by your therapist.